« Weekend in Omaha…Zoo Time! Like I do with most things, I extensively researched cargo carriers before buying. Thule and Yakima have a wide range of high quality roof racks and cargo carriers, but in the end I chose the one made by Sears. I picked the Sears X-Cargo Sport 20 for two reasons, size and price, well three if you count “because it was one of two physically in town”. Most of the carriers made by Thule or Yakima are designed for skis and the required equipment, long and flat, I was looking for something more suited for carrying a stroller, which I brought into Sear and test fit in the display model. The salesman thought I was crazy. The big name carriers also come with a big name price and I had a hard time justifying spending in the ball park of 600 dollars for something I wasn’t even sure I was going to use. The X-Cargo Sport 20 has a 20 cubic foot volume, see want they did there, and cost $200. It has a simple u-bolt mounting and a rear opening with over center hinges and a lock. It has plenty of room to accommodate a folder full size stroller, a suitcase or two and a pack n’play. It drives down the road with very little road noise. Driving under 60 mph it doesn’t make a sound, over 60 starts making a little noise but nothing to complain about. We drove 2 hours on the interstate at 75+ without a problem. The only drawback I have found is that, on top of the Outback, it doesn’t quite fit into the garage. A half an inch lower and it would clear easily, so when I inevitably forget it is up there and come barreling into the garage after a long weekend it will most likely just scratch up the top and bruise my ego, and not damage anything too badly. My original plan for a trailer hitch was, “I’ll just install one myself and save some money”. After further research I found that all the aftermarket kits are designed to mount below the bumper, this is typical for hitches but the way the rear bumper on the Outback is shaped, it would just look funny. In the end I decided to spend more money and have the dealer install the Subaru designed hitch that is integrated into the bumper. One of the other reasons I was looking at an after-market hitch is that Subaru only offers a 1 1/4″ receiver. Now, as a man this irritates me because I would prefer the larger, more manly, Class III, 2″ receiver, but as an engineer I know that the 3500 lbs towing capacity(Subaru recommends 2700 lbs) and 300 lbs tongue weight of the Class II receiver is more than enough to pull a pop-up camper, which is the largest thing I will be towing in the forseeable future. I haven’t actually pulled the camper with the Outback yet, I am sure that will be the topic of a future post, but I do like the way it looks! This entry was posted on August 31, 2010 at 11:13 pm and is filed under Cars, full of spelling and grammar errors, How To, Rants. You can follow any responses to this entry through the RSS 2.0 feed. You can leave a response, or trackback from your own site. 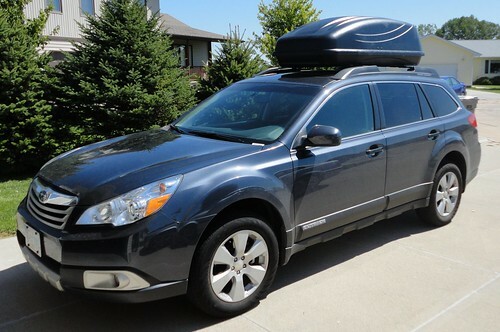 Hi, I also have a 2010 Outback and thinking of buying the same Sears X-Cargo Sport 20. Did you use the existing crossbar? I was concerned about the slight curve it has and the flat cargo bottom that it wouldn’t fit. Thank you if you can reply. Yes, I used the existing crossbar, it fit up without any problem. We do notice more road noise when you are on the highway, nothing terrible though. Thank you Ryan for your reply. I’ll be driving from New York to Orlando (16 hours) and back. Hope I make it.